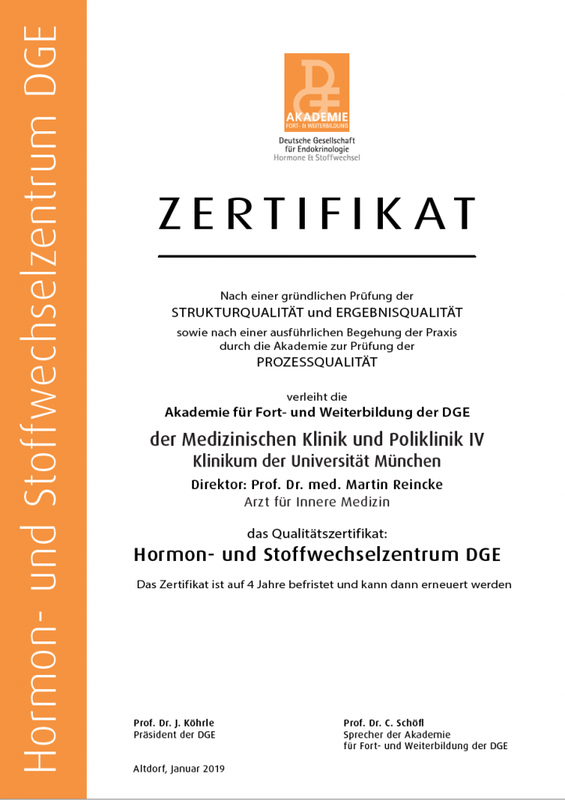 The hospital of the Ludwig-Maximilians-University (LMU) Munich (Medizinische Klinik & Poliklinik IV) is the first DGE- certified hormone and metabolism- hospital. Since January 2019 the Medizinische Klinik und Poliklinik IV is allowed to call itself out- patient and in-patient DGE center for hormones and metabolism. One year of preparations was necessary in order to collect all quality indicators. The academy of the “Deutschen Gesellschaft für Endokrinologie” (German society for endocrinology) inspected the location meticulously and questioned all hospital employees personally in the end of September 2018. More than 20.000 patients are treated at the hormone- and metabolism center of the Medizinische Klinik und Poliklinik IV every year. Thirteen medically specialized doctors and four certified medical- assistants in the field of endocrinology take care of their patients at various locations. Treated are all hormone- and metabolism related diseases. Special focus lies on the adrenal gland (Conn-register, Cushing-register, consulting for Pheochromocytoma and adrenal tumors), the hypophysis (acromegaly), the thyroid gland (ISKUM), bones (osteoporosis), the lipid metabolism (lipid apheresis), the steroid metabolism (AGS) and the glucose metabolism (diabetes). The clinic has its own specialized hormone laboratory and also a clinic for Psychosomatics to take good care of their patients.